1. An imbalance of non-structural carbohydrates. Too many non-structural carbs in the diet can disrupt the delicate balance of microbes and protozoa in the large intestine, killing beneficial bacteria and releasing poisonous endotoxins into the bloodstream. 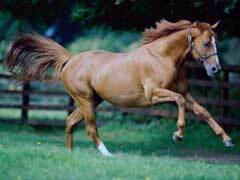 This causes restricted blood flow to the hoof and leads to equine laminitis. Can you guess where all those non-structural carbs are coming from? Spring grass, which grows quickly after warm showers. 2. Excessive weight. An overabundance of weight on both sides can often lead to a lame horse. 3. Gastrointestinal problems. Any number of GI problems, including enteritis, intestinal occlusion, colitis and peritonitis, can cause founder in horses. If any of these issues exist, they should be addressed first and foremost because treatment of these seemingly unrelated conditions may rid a horse of founder altogether. 4. Stress/Shock. This can be caused by metritis, a retained placenta, pneumonia, or pleuritis – all reasons to look into equine veterinarians who can help treat the source of the problem, and ultimately the founder. As you can see, founder may have a number of different causes. A good vet should be able to pick up on the symptoms fairly early on. It is important to treat founder in horses as soon as possible in order to avoid a worsening situation, because what some horse owners consider a simple sore foot can progress into a horse that can no longer walk if the condition is left untreated.